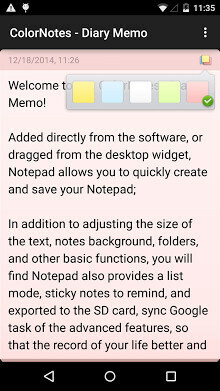 Description: “Color notes – diary memo” is a simple but powerful notepad application , is your everyday essential good helper. Fresh interface design sure to make you themselves. When you write notes, memos, e-mail, information, shopping lists, to-do list, it can give you a quick and simple notepad editing experience. You can set a reminder every important considerations, so you will not miss any important thing. You can place it on the phone’s desktop, record some easy to forget things, and there are a variety of different sizes and different colors of sticky notes can be selected. Support online backup, sync to Google’s mission, always have safety data. – Via Facebook, Twitter to share notes, and so on. – “Quick notes” development based on MiCode/Notes code, and licensed under the Apache License.